Reliance Jio has announced a new offer exclusively for Jio Prime customers called More Than 100% Cashback. Under this offer, people who recharge with rupees 398 or above will get 100% Jio cashback vouchers worth rupees 400 along with rupees 300 cashback on select digital wallets which will be instantly credited back into a user’s account. The latest offer recharges of rupees 398 or above up to recharges of rupees 700 and the latest offer is valid till 31st January. Jio’s 100% cashback vouchers worth rupees 400 will be credited immediately in the user’s account, which can be checked under My vouchers section on MyJio app. users will get eight vouchers of rupees 50 each, which can be redeemed one at a time when doing recharges of rupees 300 and above with the company’s plans. Jio was also offering the same thing in its Triple cashback scheme. 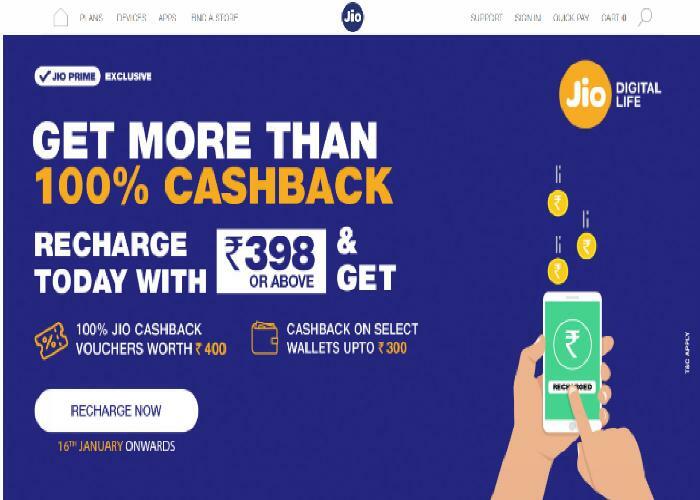 Jio users can downlord mobile recharge application MyJio or Jio’s partner retail stores JioMoney, Paytm, Amazon Pay, PhonePe, MobiKwik, Axis Pay and Freecharge to get the cashback. User can also recharge Jio official web-sight Jio.com or Reliance Digital Store.